This January, a very special event is coming to Niseko, and you’re invited. Be mesmerised by the incredible, world-class artistry of Richard Tognetti and members of the Australian Chamber Orchestra when they return to Niseko. 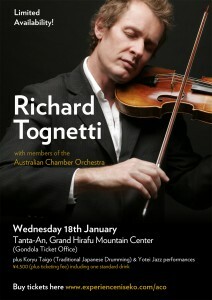 Richard Tognetti is a world renowned violinist and the artistic director of the Australian Chamber Orchestra which he has led for over 25 years. As Matthew Westwood wrote last year in The Australian, “A quarter-century ago no one could have ­predicted what the ACO would become under Tognetti’s leadership, yet a confluence of events, people and ideas about music created a powerful momentum”. Together with his wife Satu Vanska and friends from the Australian Chamber Orchestra, they will be playing two concerts in two different venues in Niseko. On Wednesday 18th January at Tanta-An (Grand Hirafu Mountain Center 2F) performance attendees will be treated to their first show at 5.00pm. The evening will warm up with performances by Kutchan’s own Koryu Taiko Drumming association and the Mt. Yotei Junior Jazz School. For more information and ticket CLICK HERE.